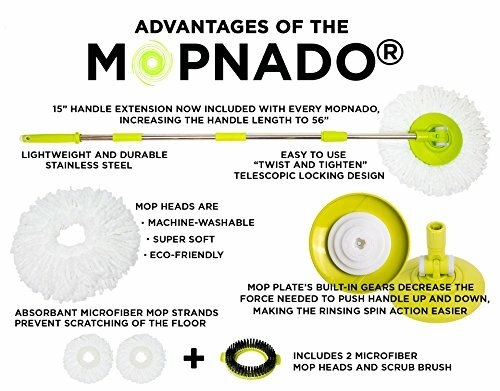 Tired of Buying Poorly Made Mops That You Eventually Have To Throw Away? Built to LAST - Compare us with other Mops and there is simply NO COMPARISON 1) The ONLY Spin Mop with a STAINLESS STEEL Spin Dry Basket 2) Heavy Duty STAINLESS STEEL Handle with Height Adjust and Optional Extension, NO PEDAL to break 3) Heavy Duty ABS Plastic With Oversize Wheels and Carrying Handle Designed to make Mopping Faster and Easier than ever, GUARANTEED Versatile:Patented Spin Cycle allows precise control of wetness to allow for use on all surfaces including wood. 4) Cleaner water: Built In Agitation That Spin Cycles The Dirt Off In The Rinse Bucket. 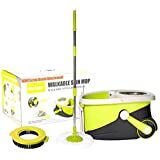 5) Save your back: The Only Spin Mop With Wheels / Retracting Handle 6) Scrubs and Cleans: Includes NEW Scrubber Brush Attachment and 2 Machine Washable Microfiber Mop Heads last 6-8 months. Affordable refills available on Amazon 7) Convenient: Built In Soap Dispenser 8) Save Time and money Guaranteed to reduce time spent mopping, and save money by no longer buying refillable mops. The bucket measures: 11.5" tall 20" long and 13" wide. 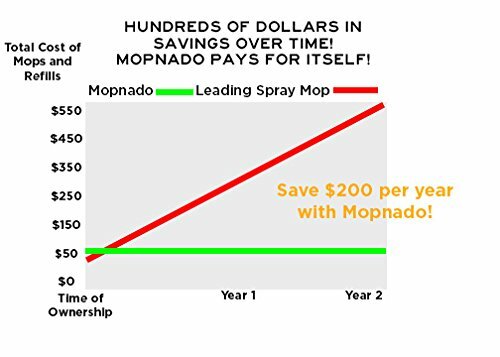 Mopnados are warranted for one year from the purchase date. Wear and tear are not covered. NOW INCLUDES EXTENDED LENGTH HANDLE - SAVE YOUR BACK - Our spin mop now includes a 56 inch long handle fully extended. No Need to buy extensions or other accessories - this is all you need. 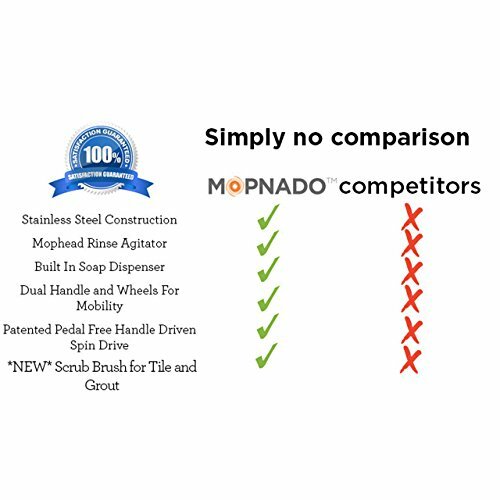 EASIER TO USE THAN THE COMPETITION - Our patented mop plates make rinsing the mop head easier than any other mop on the market. 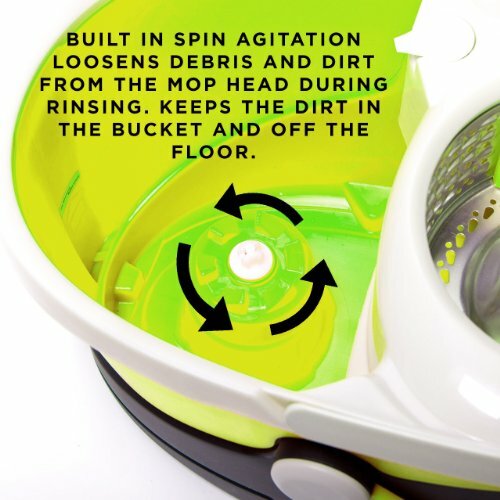 You don't have to spend as much energy to get the mop head to spin. Satisfaction guaranteed. YOUR HOME DESERVES THE BEST QUALITY - Our Deluxe Model features large wheels and 2 handles for easy mobility while cleaning. 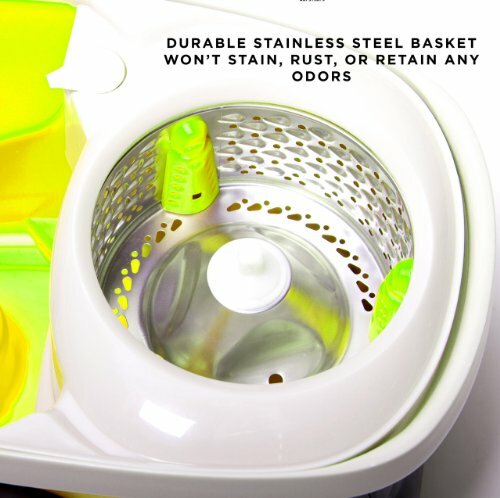 Our spin dry basket is Stainless Steel, unlike our competition who uses plastic or aluminum. The Mopnado handle is also constructed out of stainless steel for durability and backed by our 1 year warranty. 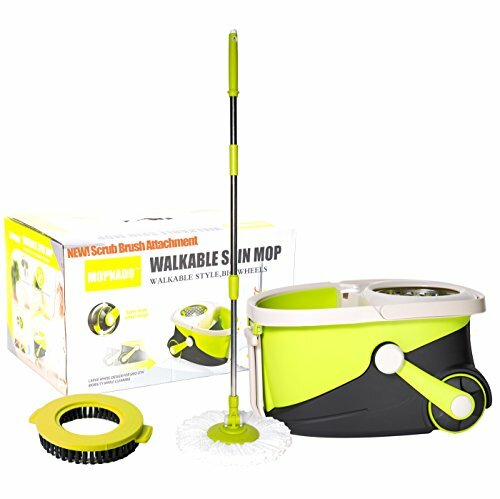 NEVER BUY ANOTHER FLOOR CLEANING SYSTEM AGAIN - This kit includes 2 microfiber mop heads, a scrub brush attachment and a cleaning solution dispenser built into the mop bucket and the highest quality stainless steel handle set. MAKE CLEANING YOUR FLOORS A BREEZE - Perfect for cleaning your hardwood floor, laminate, tile or even concrete. 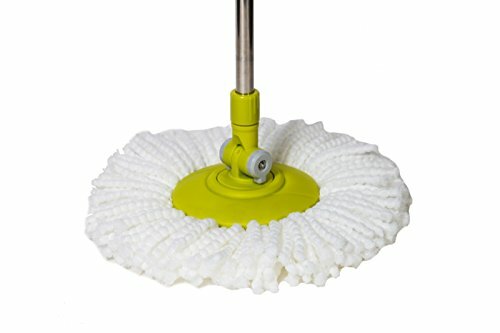 Mop heads are durable and machine washable, better value than cotton mops. 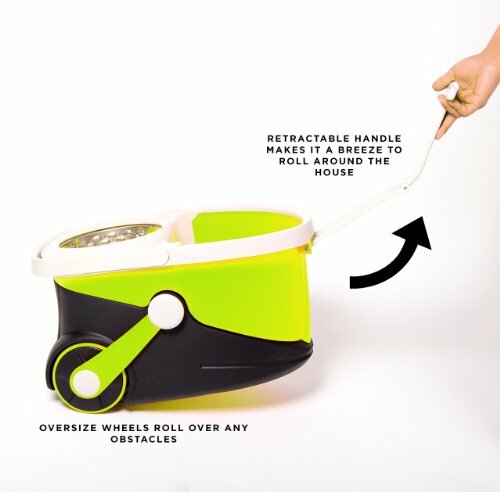 The 180* swivel of the mop head makes it easy to reach under furniture, the lock allows you to extend up to clean windows. 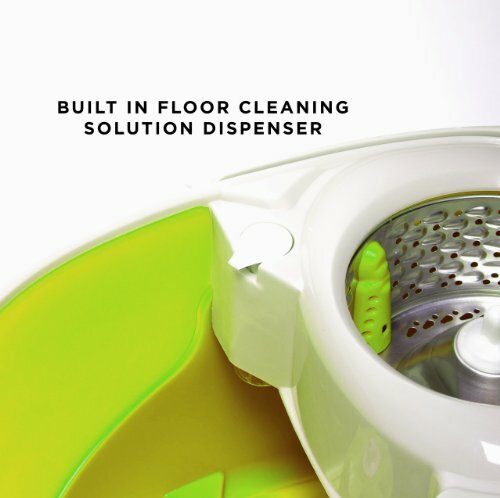 Save time and clean your floors in half the time.